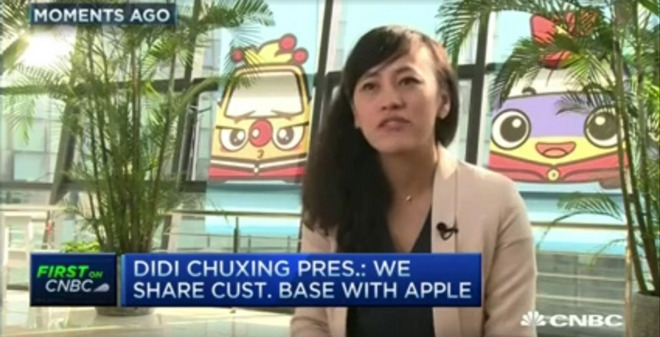 In a TV interview, Didi Chuxing president Jean Liu dropped more hints about the possible reasons for Apple's $1 billion investment, suggesting a technological connection. "We actually share a huge overlap in customer base," Liu told CNBC. "Our driver base, our passengers, they use Apple and iPhone a lot, iPad, I think it's very intuitive." The executive pointed out that the potential scale of the Chinese ridesharing market is much larger than the U.S., claiming her company has only a 1 percent penetration of about 1.1 billion daily Chinese commutes. The number of rides Didi provides in Beijing every day is five or six times the entire New York ridesharing market, she said. Along those lines, Liu suggested that technology is a solution. "All we are focused [on] right now is number one, on technology," she said, "how we can match the supply and demand, i.e. the vehicles, the drivers, with the passengers." Apple could be hoping to fill the gap, though there are number potential ways this might happen. On a basic level Apple might offer to integrate its devices, software, and/or services, such as Apple Maps. The company is also believed to be developing an electric car, however, which could become self-driving. Selling such vehicles into the Didi fleet might be lucrative. When Apple's investment was first revealed, Apple CEO Tim Cook said only that it was made "for a number of strategic reasons," such as "a chance to learn more about certain segments of the China market." He later added that Didi had an "environmental" objective, reducing pollution by making more efficient use of cars.